Real talk: Thanksgiving turkey ain’t all that. The skin is good (especially if you roast a second time in the oven separately) and the carcass is great for stock. But the main event meat? I’ve never found turkey satisfying, much less have it reach craveable heights. Even if you find the concept of Thanksgiving dinner delicious, its deliciousness is rarely attributed to the bird, rather, dinner in the aggregate. So may I make a humble suggestion that’s 1) more crowd-pleasing, 2) easier to cook, 3) at least twice as delicious? This Thursday, make yourself a Thanksgiving porchetta. 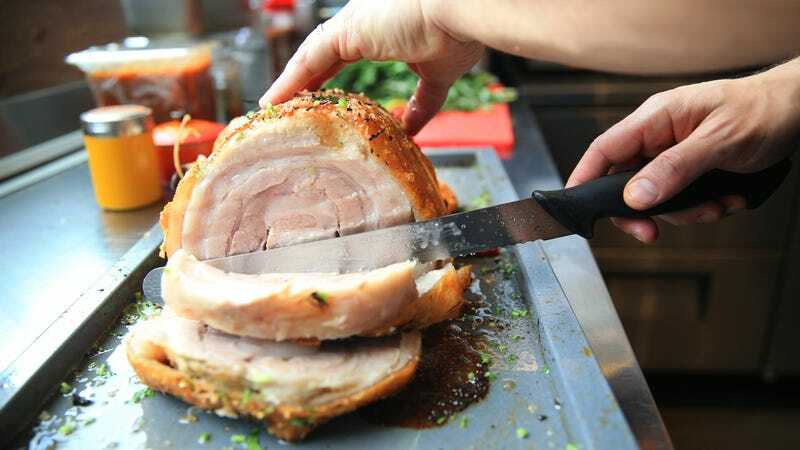 The porchetta is a showpiece dish of Italian gastronomy—essentially, a pork loin and belly slab rolled into a tube, trussed with twine, rubbed with an herbaceous marinade then roasted until skin and fat are crispy. When you slice porchetta it comes out as discs of pork—juicy on the inside, a layer of belly fat surrounding, and a crackly exterior surrounding. Served as is, it’s the king of pork roasts, but an even more popular application involves piling high onto a sandwich. My inspiration comes directly from Publican Quality Meats, a butcher/sandwich shop in Chicago (if you’ve ever visited Chicago and been to Blackbird, Avec, Big Star, The Violet Hour, it’s from the same team). I used to live two blocks away from the butcher shop, and every Saturday at noon, an adult pillow-sized porchetta roll was brought out and placed on top of the glass deli case. The smell was intoxicating, a Tuscan bouquet of garlic, rosemary, garlic, olive oil, garlic. Sliced warm from the porchetta, the slices would get wrapped in deli paper, and I’d find a nearby park bench and make it quickly disappear. This past weekend, I invited a few friends and made Publican’s porchetta recipe, which happens to be in their cookbook Cheers to the Publican, as well as reprinted and modified below. It’s a straightforward recipe: Two nights before serving, salt the pork slab and let it hang in the fridge. One night before serving, make your marinade paste and slather it on the pork, then tie into a roll with twine. Five hours before serving, roast that bad boy. This was one of the top two of best hunks of meats I’ve ever roasted (neck-and-neck with this)—I don’t say this to brag or to exaggerate The Publican’s excellent recipe. It’s more that when you have a gorgeous piece of pork that’s nearly one-third fat couple with a pungent marinade, the resulting roast can’t be anything but superlative. I asked my local butcher (support your local butcher!) for an 10-pound slab of pork belly with the loin attached. Here’s the part that may stoke controversy: I asked for the skin removed, trimming down until a 1/2-inch layer of exterior fat remained. If you opt to roast skin-on, be sure to criss-cross score the rind with a sharp knife spaced a half-inch apart. Once you roll up the porchetta and tie with twine, don’t be as heavy-handed as I was slathering the marinade paste on the exterior fat. Look at the photo down the page of the pre-roasted porchetta (bottom left of the grid), and use about one-third the marinade as pictured. The reason is the garlic and rosemary burns and turns acrid from the long roast, so a lighter touch is favored. As for the interior marinade? Go nuts. My favorite accompaniment with porchetta? Italian salsa verde. I could come up with a recipe, but it won’t nearly be as good as this one from Serious Eats. I make this sauce the night before and add MSG powder—the flavors seem to really bloom overnight. I called up Publican Quality Meat’s head butcher Joe Frietze for some additional pointers. He suggested after roasting, let the porchetta rest for at least one hour! Thermal momentum will finish cooking the interior, and more importantly, it’ll help retain that incredible juiciness. The internal temperature you’re looking for is 120 degrees Fahrenheit. This is not a typo. Standard medium-rare pork is about 145 degrees internal, so this seems way low. It’s not. It came out perfect at that temp. Frietze suggested serving the porchetta the way he does at the sandwich shop: On a crusty ciabatta roll, with Dijon-mayonnaise, pickles, and meat sliced thin and piled high. He also said porchetta is killer with pimiento cheese between toasted bread. In non-sandwich applications, Frietze likes to cut the porchetta into 1/4-inch-thick discs, then top it with roasted vegetables, or perhaps chicories, apples, and roasted pecans with a mustard vinaigrette. 1 10-pound boneless pork middle section (belly + loin), skin removed, fat scored. Two days before serving, place pork slab onto baking sheet. Score the fat in a criss-cross fashion, about 1/2-inch apart with a sharp knife. Season with salt and pepper evenly and let sit in fridge. You may want to consider wrapping the baking sheet with plastic wrap because the smell will permeate your fridge. The next day, combine all non-pork ingredients listed above, minus the olive oil, into a food processor. Blend on low and slowly pour olive oil in. Bring up to medium and whazz it up until it’s paste-like. Slather this on the meat-side of the porchetta evenly. Roll up the pork, starting from the loin, with the pork belly wrapping around it. Tie with twine tightly at one-inch intervals. Add some of the marinade paste on the exterior (though not as much as pictured below). Place back into fridge and lightly wrap plastic wrap around the pork and baking sheet. Let sit overnight. Six hours before serving, remove from fridge and let come to room temperature for an hour. Meanwhile, preheat oven to 300 degrees Fahrenheit. Transfer porchetta to roasting rack and cover with foil, and place into oven. After about two hours, stick an instant-read thermometer into the meaty loin—you’re looking for an internal temperature of 100 degrees Fahrenheit. If it’s not there yet (and likely it won’t be), re-stick the thermometer every 15 minutes. This may take up to three hours, give or take. After it hits 100 degrees, remove the foil and crank your oven to 450 degrees. Your final benchmark is 120 degrees internal, and you’ll want to check 30 minutes after cranking the oven. Once the meaty loin hits 120 degrees, remove porchetta from oven. Ideally let rest for an hour, but you can get away with 45 minutes. Snip off the twine and slice thinly. Pile onto ciabatta and serve with either Italian salsa verde or Dijon-mayonnaise, or by itself. Serve while warm. Happy Thanksgiving.